New Tigers’ star Kasper Andersen wants to end “on a high” after a rollercoaster season. The Dane thought his season was over after he was KO’d and left with a broken collarbone after a pile-up at King’s Lynn. 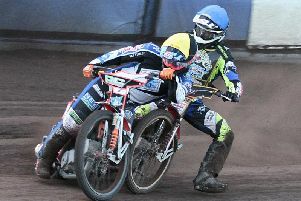 But Andersen has returned to action with Sheffield in style, including a 13-pt haul at Edinburgh on Friday. Now he hopes to keep up the form in Tigers’ final home league meeting on Thursday against Edinburgh. He said: “I hope we can end on a high. It’s been a tough year for me and Sheffield. I didn’t have an easy time at King’s Lynn and don’t remember anything of the crash. That’s a good thing because I can’t fear anything from that night. The rider did a great job for the Tigers in their defeat at Armadale, beating the likes of Ricky Wells and Erik Riss in the process. He added: “It is tough to me to come to a new team at this stage of the season. I’ve had to learn to meet everybody and prove myself that I am good enough to be in the team. “But to get to the team who are low on confidence has probably made it harder.